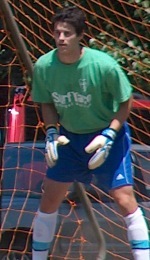 Jersey Shore Boca goalkeeper Jon-Curry Edwards played a big role in the success of the Boca U23 team during the 2006 summer season. Staff writer John Bush of the Asbury Park Press features the Spring Lake Heights native in a recent story as the standout GK prepares for the fall college soccer season at his new home, the University of Delaware. No matter who played in goal for the Jersey Shore Boca U23 men’s soccer team this summer, coach Walt Konopka didn’t have to worry. Whether it was his son, Chris Konopka, or Jon Curry-Edwards, chances are the Boca squad would keep its opponent from scoring. Behind its two keepers, Jersey Shore went 13-3-1 overall this season. Boca ended its summer with a 2-1 loss to West Chester United 82 Coppa in the semifinals of the Mid-Atlantic Soccer Showcase League Cup championship on Sunday at the John F. Patrick Sports Complex in Lakewood. Curry-Edwards received most of the playing time. He started 11 games, allowing just 14 goals and posting one shutout as Jersey Shore finished second in the MSSL regular season. Konopka, an emerging star at Providence College, had four shutouts in six games and allowed just two goals. A standout at St. Rose High School in Belmar who lives in Spring Lake Heights, Curry-Edwards will be a redshirt junior this fall at the University of Delaware after transferring from Old Dominion. In two years at Old Dominion, Curry-Edwards played in just one game, a 6-0 victory last season over Georgia State in which he played 25 minutes and made one save. At the season-ending MSSL championship, Curry-Edwards was the goalkeeper in the 2-1 loss. Earlier, Chris Konopka had pitched a shutout in Boca’s 1-0 quarterfinal victory over the NJ Rangers FC Golden Hawks, making a big stop at 0-0 early in the second half. Curry-Edwards’ best game may have been in Boca’s 1-0 loss to national powerhouse FC Delco in the semifinals of the United States Adult Soccer Association Regional U23 championship in Horsham, Pa., coming up with two point-blank saves in the second half to keep Jersey Shore in the game. Succeeding at the Division I level is something Chris Konopka has already established. Playing his first full season last fall, the 6-foot-5 Konopka led the Friars to a 7-4-9 record, the 10th biggest turnaround in NCAA history after a 0-16 record the previous year. Providence reached the semifinals of the Big East Tournament, and made the NCAA Tournament for just the second time in school history. The Friars blanked Hofstra, 1-0, in the first round of the NCAAs before losing to North Carolina, 2-0, in the second round. Overall, Konopka allowed just 21 goals in 20 games. When not playing for Boca this summer, the former Toms River High School East star was training with the Red Bulls at Giants Stadium. In the games when Curry-Edwards was in goal, Konopka usually could be found on the field anyway as a forward and a defender. He even scored two goals this season.